This simple beet raita is a chilled yogurt sauce made with beets, yogurt and a few spices. It’s a simple cooling side, a perfect accompaniment to a spicy dish. 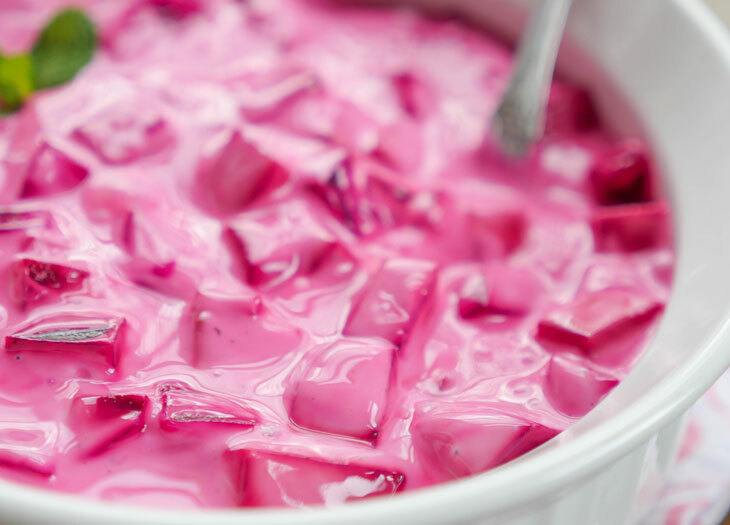 This beetroot raita is as delicious as it is fun to look at! 😍It’ll steal the spotlight on your table – I mean, look at that bright pink color! And this raita has a very useful purpose too: to provide a bit of cooling comfort after biting into a spicy dish. Everyone familiar with Indian cuisine knows that raita is a must at every Indian meal. Typically I serve a super simple raita – just a bowl of yogurt thinned out with a little water and a few spices. But whenever I make a special type of raita, the entire meal feels a bit more special. 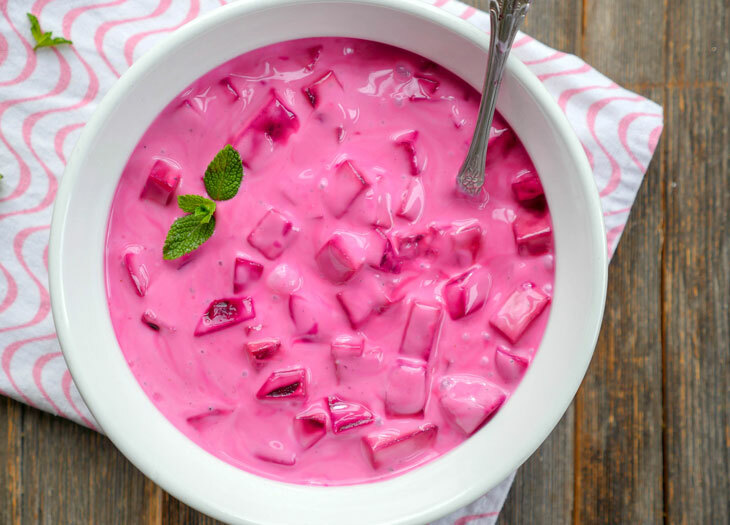 Beet raita – with it’s BRIGHT pink color – definitely looks special and it’s also very easy to make – especially because I first cook the beets in an Instant Pot. 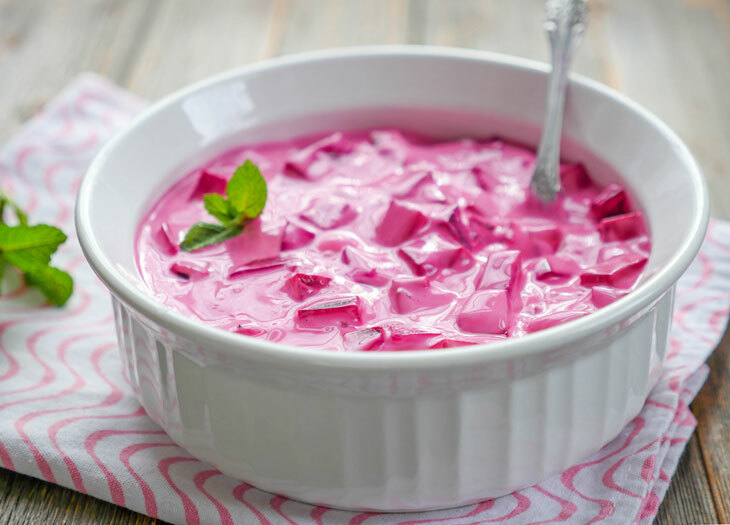 My recipe for beet raita is very simple – it’s an every day type of raita. Quick to prepare and beautiful to look at. You can of course always make it a bit fancier if you prefer by adding a tadka to it – that just means to heat oil in a small pot and add spices like mustard seeds, curry leaves or chilies. You can make beet raita several different ways – and change up the texture. Try chopping the beets (pictured) or grate them or puree them! I personally prefer chopped beets because it’s easy, adds texture and the beets look like little gems floating in sauce! This cooling beet raita is the perfect accompaniment to any Indian meal, especially a one pot meal! My favorite super simple Indian meal: biryani and raita. My recipe calls for very few ingredients – but if you’re new to Indian cuisine, you may not be familiar with one of them: roasted cumin. Roasted cumin tastes totally different from regular cumin in my opinion. It has so much aroma and depth and adds a special flavor to the raita. It’s a spice that’s in almost every raita recipe – or at least, it should be. Just be sure to read my notes to see how to make it! Trust me, it will be worth it and you’ll love it! 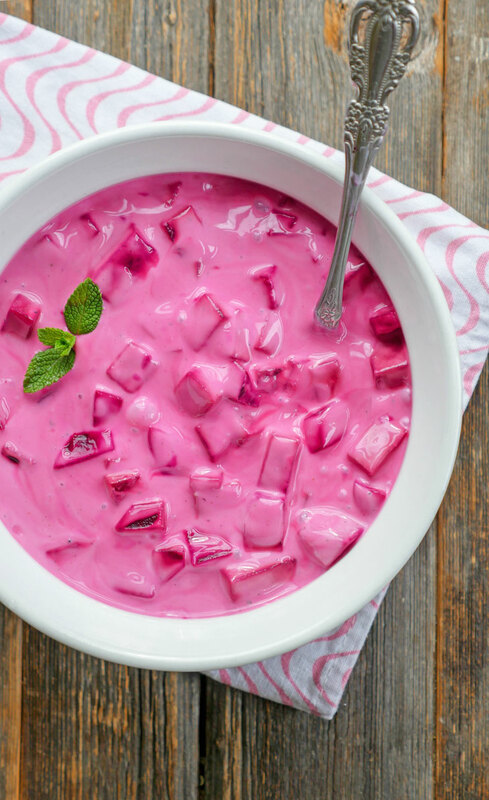 This cooling beet raita is the perfect accompaniment to a spicy dish! Serve it with a one pot meal like biryani or with any Indian meal. Combine all of the ingredients together in a bowl and mix well. Serve immediately if chilled, otherwise allow it to sit in the fridge until nice and cold. To prepare the beets, add 2 cups water into the steel inner pot, then place a steamer basket or the wire rack that came with your pressure cooker into the pot. Place the unpeeled beets on top of the rack, then secure the lid, close the pressure valve and cook for 15 minutes at high pressure. Once the the beets are cool enough to touch, remove them from the pot. The peels should easily slide off. Place the beets on a cutting board and chop them into the desired size.